Optimal health – health that gives one the greatest chance for a long, active, vital life – is much more than simply the absence of disease. It means being the very best you can be. It means not being incapacitated or wasting away physically, physiologically, emotionally, or mentally. We do not "live longer today" as popularly believed and promoted by medical interests; only average life span has increased, and this is due to decreased infant mortality which is, in turn, due to improved food distribution and hygiene – not medical measures. Actual longevity, the potential to live in a healthy state to a ripe old age, is decreasing. 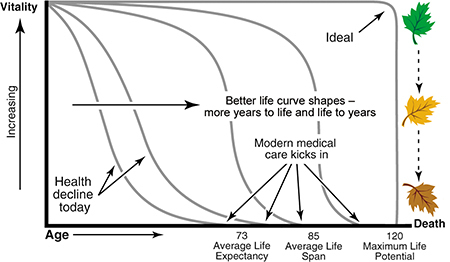 If we chart health and vitality against age, the curves to the left on the chart represent typical loss of health and then languishing for decades under medical care. The goal should be to maintain optimal health and vitality right out to our genetic limit (squaring the curve) with life ending like a leaf falls from a tree. Modern medical measures extend the amount of time we can live in an incapacitated state in a hospital bed or nursing home. Such disease and crisis care intervenes after the fact. It does essentially nothing to improve the health capacity and fulfill potential to resist disease and avoid degenerative conditions. For the majority in today's modern setting, full health and youthful vitality begin to ebb shortly after adulthood. A variety of degenerative conditions, no longer masked by the resiliency of youth, begin to surface and take their toll in the form of lost energy, weakness, susceptibility to infections, inability to maintain proper body weight, loss of stamina, decreased digestive capabilities, failing libido and fertility, and accelerated aging of the skin, organ systems, joints and brain. These changes don't occur suddenly, but gradually accumulate over the second, third and fourth quarter of life to leave people in their 40's and 50's dramatically less than they once were. This has become so common that people now resign themselves to this fate, believing that it is the normal aging process. But this doesn't have to be the case. There is the genetic capacity within humans to live to 120 or more. But it is not just adding years to life that is important, rather it is adding life to years. Our goal should be to maintain active, healthy, vital, full potential all the way out to our genetic limit. All creatures on Earth are intricately honed to a certain environmental niche that will provide them the greatest chance for optimal health. Unfortunately, the proper human niche is not the modern artificial world of convenience we have created. If we are going to make a journey toward optimal health, we must, therefore, understand our origins, our roots, where we have started. To best understand where we belong and how to make the wisest life choices, consider that our modern technological world began only about 200 years ago with the beginning of the Industrial Revolution. If we construct a time line, the past 200 years – during which we have increasingly isolated ourselves from the natural environment and consumed a variety of fractionated processed foods – would be one inch. That is compared to the total length of time during which life (by most estimates) has been on Earth, represented by 300 miles. 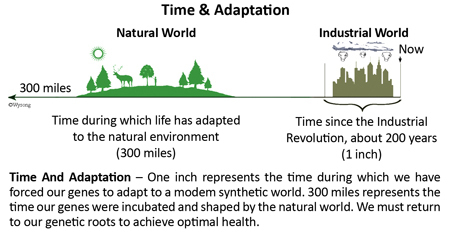 During the entire pre-industrial period (300 miles) humans and other creatures were exposed to natural fresh air, sunshine, clean water, connection with the earth, and fresh, natural, raw foods. Obviously our genetic program could not conceivably have become modified in only one inch of the 300 miles in order to accommodate the modern, artificial environment. Therefore, the key is to return, to the degree it is possible to do so, to the natural environmental context represented by the 300 miles. By matching our lifestyle to our genetic program – what we are adapted to in nature – we have the best opportunity of achieving optimal health. It is by violating one's own nature that disease presents itself. Helping you return to these healthful genetic roots is the goal of Wysong. 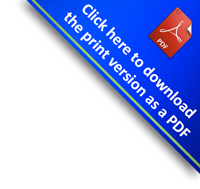 The following guidelines for humans and animals outline the results of 35 years of research and an extensive review of the medical literature and scientific literature. The base of the pyramids represents basic lifestyle choices everyone should attempt to incorporate into their lives. Then built upon this base are dietary and nutritional supplement guidelines to help everyone return to their proper nutritional genetic roots. 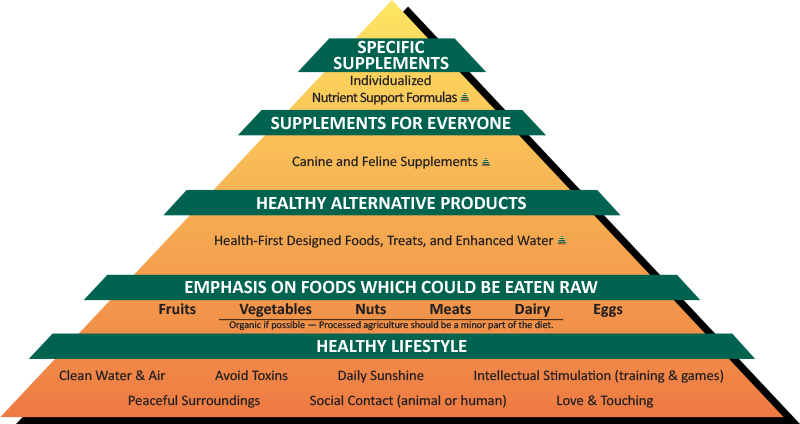 The bottom layers of the pyramids apply to everyone, whereas the top of the pyramid can be customized for individuals experiencing specific problems or wanting to focus on the prevention of certain conditions. No one will be able to follow the pyramid perfectly. Doing so is not absolutely necessary, rather, continuing to edge life closer and closer to this ideal should be everyone's goal. 1. Make EXERCISE and physical activity a part of everyday life. A combination of aerobic and weight bearing exercises is ideal. In the wild, considerable effort would be required just to eat. That effort should be emulated even though food is readily available in modern society. Think: no exercise; no food. 3. Breathe fresh AIR. Change your residence and occupation if the air is toxic and do all that is possible to purify the indoor environment. Consider a negative ion generator to increase electron flow in the lungs. 7. Get plenty of SLEEP. Take a nap at midday. 8. Convert the DIET as much as possible to fresh, whole, raw foods that can be consumed exactly as they are found in nature. These foods include anything that does not have to be cooked or processed in some way in order for you to eat and digest it. This includes vegetables, fruits, nuts, eggs, dairy, and meats. If these foods are processed, it should be done minimally such as lightly steaming vegetables, cooking meats rare, and soft boiling eggs. Starchy foods should be whole and minimized in the diet. If at all possible, obtain foods from organic local sources. Processed agricultural products should be a minor part of the diet and should be whole and organic if possible. 9. If ILLNESS strikes, seek natural solutions. Review the above recommendations to make sure that violation of these is not the cause. Nutritional supplements that have been designed with an understanding of the above principles should be used both as a preventive measure and as a first option when trouble strikes. Before submitting to dramatic medical intervention, seek a second opinion from a credible alternative physician. Use the Internet to get informed and be your own doctor. Do not expect immediate cures for ailments that have lingered for years or developed over decades. Be patient and confident that your informed approach is correct. 10. Remove STRESS caused by situations in which you feel hopeless or helpless. You must always arrange your life such that you feel in control. 11. Seek RELATIONSHIPS that bring happiness, peace, and a sense of self-worth. Additionally, we all need to touch people and we all need to be touched. 12. Find a career, a hobby or a sport that interests and CHALLENGES you. Do not be an automaton and simply live the will of others. Find something that taps your creative juices, make interesting goals, and seek a sense of excitement about the future. 13. Be always LEARNING. Be inquisitive about broad areas as well as special interests. Be committed to truth – not vogue dogmas. Be open-minded. Make self-improvement a work always in progress, and set lofty goals of being a better you and leaving behind a better world. 1. Follow the suggestions at the pyramid base every day. 2. Rotate the variety of Wysong Diets along with fresh foods. 3. Supplement with various E.F.A. 's™, Biotics™, Pet Inoculant™ and DentaTreat™. 4. If feeding only raw foods, supplement with Call Of The Wild™. 1. Follow prevention steps 1-4 diligently. 2. Use the appropriate Wysong RX Diet prescribed by your veterinarian. 3. Use Wysong Immulyn™ and other NSF nutraceutical supplements targeted to the condition. 4. Use Wysong PDG™ for concentrated nourishment if appetite is suppressed or weight is being lost. 5. Offer pure water enhanced with WellSpring™. Food choices are not a matter of right or wrong, black or white – they are shades of grey. By understanding what is the ideal and what is not, intelligent decisions can be made which at least take us ever closer to the healthiest ideal. Try to make choices as nearto the top of the arrow as possible. 1. Fed in proportions found in would-be prey: Approximately 62% meat, 11% organs, 2% bone, 25% vegetable. 2. Follow label directions for both Pet Inoculant and E.F.A. Use daily particularly if disease or stress is present. 3. Wysong Diets are formulated, processed and packaged to be as close to the natural diet as possible. A "premium" food is usually high in fat and protein, with meat products listed among the first ingredients. A "generic" food is a very low cost, grain fraction-based diet with meats as minor ingredients. Neither cost nor advertising can be trusted to determine value. A "premium" may be a "generic" nutritionally. Carefully study the ingredients, company philosophy, qualifications of those leading the company, and results from your pet. Short periodic e-mail postings containing provocative thoughts, new research findings, resources, new products, humor, health-related news...and more. Visit WysongEducation.net to subscribe.. Explains how fats and oils can be both villains and heroes in the search for health in both humans and animals. 170 pp. illustrated, scientifically referenced, and indexed. Provides a fundamental, unique understanding for why excess weight in people and animals is a modern epidemic. A solution is described which requires no dieting. 270 pp. illustrated, scientifically referenced, and indexed. Guide to alternative sources of health care, self-improvement, environmental improvement and much more. Over 335 resources. This is where you turn when you have a problem that is not being solved, want an alternative medical second opinion, and want help getting control of your own health destiny. An entertaining and thought-provoking relook at how health should be approached. Dr. Wysong wipes away all the modern assumptions on nutrition and health and with a clean slate logically rebuilds proper thinking. If you would like to take control of your health destiny and that of your family and pets, and know you are doing the right thing, this is the place to start. A 256-page, 32-chapter book describing the crisis in the modern approach to animal feeding. A definite eye-opening wake-up call for anyone wanting to avoid modern pet feeding traps and learn how to take intelligent control of health. A 28 pp. booklet with practical advice about feeding your pet to optimize health and longevity. Includes background and recipes Illustrated. DOES AMERICA OWE AN APOLOGY TO ITS PETS? A booklet explaining the drawbacks of feeding the same processed pet foods every day, and the varied approach to optimal feeding which leads to health and longevity.